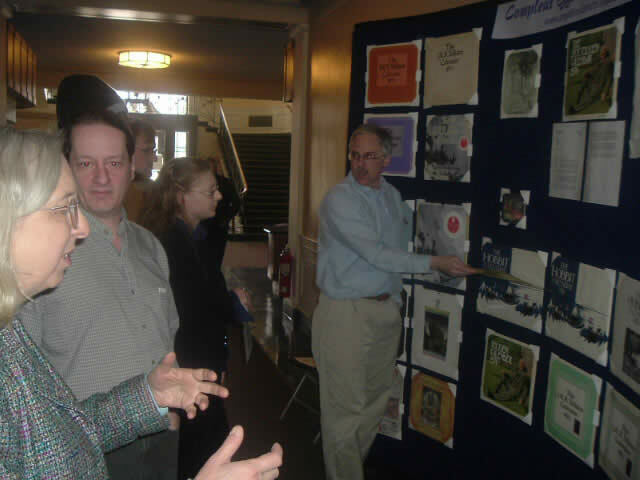 picture of Phil Goss with Jessica Burke, co-chair of the North East Tolkien Society, and several other participants at Tolkien 2006 at the University of Vermont. Phil Goss did a display of about 30 selected calendars. 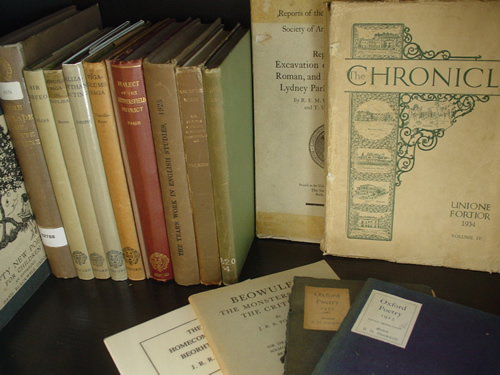 A collector of Tolkien calendars, and the person behind the website "The Compleat Gyde to Tolkien Calendars". Male, over 50, lives in Vermont, USA . Tolkien calendars. They are fairly easy to collect (still lots of them available) and are not outrageously expensive (even for true rarities). I love the interpretations of the many illustrators – from the well-known (Howe, Nasmith, Lee) to the less commonly known (the many illustrators of the various Tolkien society issues) to the up-and-coming (Henning Janssen). For that reason, I don’t collect the many movie-related issues (as those are basically still photos from the PJ movies). I started reading LotR at college in 1972. My roommate bought the 1974 Ballantine which I kept after he discarded it. I started getting the calendars for Christmas after that. But I had missed the 1973 issue and later on missed the 1984. I assumed that one was not going to be issued in 1984 after no publisher put one out for 1983. So, three or four years ago, I decided I would find those missing ones. My wife showed me how to use eBay. At that point, I discovered the Allen&Unwin issues from the UK. Then I started visiting various Tolkien message boards and found out about the many issues from the various Tolkien societies (e.g. – Italian, Polish, Finnish, Dutch, American, Beyond Bree) and the many "variant" calendars (those published in languages other than English, e.g. – Spanish [Minotauro], French, and German). My username on the many Tolkien message boards is Parmastahir ("parma" = book, "asta" = month, "hir" = to find, so "book of months finder" or "calendar collector"). 188 calendars. For many of them, I have two copies: one opened, the other mint. I have been able to catalog about 200 different calendars. I need about 28 calendars (from older rarities to recent ones from the Polish TS) to get them all. Without any doubt, a 1974 Allen&Unwin calendar that was inscribed and signed by Professor Tolkien. It would have been issued July or August of 1973. Thus, it would be one of the last items that he signed. It’s thus a bit bittersweet. "The Compleat Gyde to Tolkien Calendars" I update it as "new" calendars are discovered or issued each year. The information includes: publisher, ISBN, illustrator(s), dimensions, cover and mailer/envelope pictures. I receive questions about the calendars via an email link. I also update a "Calendar of the Month" link in which I provide pictures of all twelve of the monthly illustrations and any poster/centerfolds included. No doubt, the best thing is the people that I have met (if only virtually) who also have the calendar-collecting bug. Various web sources (e.g. – eBay, on-line booksellers, etc) will get you only so far. After that, you have to network to first discover and than obtain a copy of the many rare or uncommon issues "out there". We support each other with tips and sources. I have had two people send calendars to me "out of the blue" (completely unsolicited) because they had visited my website and thought that I would like to add them to my collection. I really enjoy advising "newbies" (those new to calendar collecting) on eBay "tricks", sources of calendars, how not to overpay, etc. Finally, it’s the thrill of the hunt!